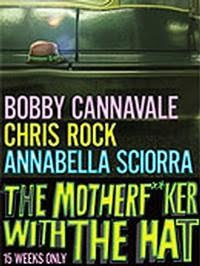 Comedian Chris Rock makes his Broadway debut in Stephen Adly Guirgis’ The Mother F**cker with the Hat. While seemingly a far cry from stand-up, the “dark, dark comedy” retains some of its humor as Rock plays a drug counselor to a recovering addict who is still shacked up and madly in love with his not-so-sober ladylove. Don’t miss the opening night of this tale of love and fidelity...and certainly don’t misplace your hat.